THE HISTORY CHEF! 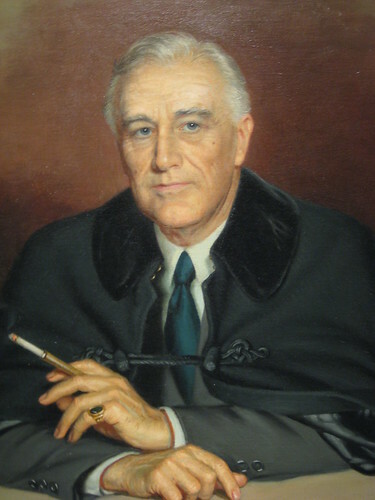 : Franklin Delano Roosevelt, World War II, and "There's Not Enough Milk for the Babies"
Franklin Delano Roosevelt, World War II, and "There's Not Enough Milk for the Babies"
On February 19, 1942, just two and a half months after the Japanese attack on Pearl Harbor, President Franklin Delano Roosevelt signed Executive Order 9066 which led to the internment of more than 125,000 Japanese-American citizens who were removed from their homes and detained in internment camps until the end of World War II. Why soup? Throughout history, soup has been one of the primary foods consumed by poor and homeless people. If you think about it, this makes sense because soup is economical (it can be prepared with whatever scraps of food are available and can be stretched to feed more people by adding water). It is also quick and simple to make (only a pot is needed) and easy to serve (it requires only a bowl and spoon, or, "in a pinch, can be sipped"). Today, green turtle soup is prohibited in the United States because most species of sea turtles are considered threatened or endangered. But you can try this simple and delicious recipe for Creamy Chicken Soup which Eleanor surely would have enjoyed before setting out on one of her "supercharged" afternoons.